January was the turning point for Newcastle. | NUFC Blog. January was the turning point for Newcastle. Routledge: Key man since his arrival. Now the job of promotion has been achieved we can pick start to pick through it and have a look at what we have done right and wrong throughout the season. The very fact we have won the title would indicate that the right outweighs the wrong through the course of the season, but it’s January that held the key to promotion for me. In the first half of the season we tended to wear opposition down and never really looked like a balanced team, with most of our play coming down the left side with Jonas Gutierrez and Jose Enrique whilst virtually nothing coming down right through Danny Guthrie. That sounds harsh on Danny G, but it wasn’t meant to be. What I was trying to say is that Danny Guthrie is not a winger, although he did get his fair share of assists from crosses and free-kicks out wide. Guthrie is a central midfielder, that is his favoured position which meant he tended to be drawn into the middle of the pitch, forcing us to look more lopsided as a team. Anyway, he was just doing as he was told and it was a case of needs must, so credit must go to him for giving it a go and playing where he is needed, Kieron Dyer should take note! This is where January came in handy. We had already acquired Fabrice Pancrate in an effort to improve the balance of the team and play on the right hand side, but it turns out that aside from his wonder goal against Watford, he just wasn’t that good. Then out of the blue came the signing of Wayne Routledge, in my view it was the signing that ensured we would still be towards the top of the table when the season came to a close. Many fans said that we lacked pace and creativity, and that someone like Routledge would be ideal after his performance against us at St James’ Park. Since his arrival he has continued to be a creative force, whilst adding goals to his game at the same time. When Wayne plays the side has balance and the team looks much better going forward as we have a player who knows how to stick to the wing and not drift inside. It’s not all about Routledge though, Mike Williamson has proved himself to be able to deal with whatever the Championship has to throw at him and has been a more than able deputy throughout Steven Taylor’s long term injury lay-off whilst Fitz Hall has also featured and done well enough when called upon. Aside from individual players and how well they have done, the most pleasing aspect has been the ability to identify weak areas of the team and knowing how to improve them. I also think that without the four January signings we faced a real threat of our promising start to the season fizzling out. Injuries were starting to become more frequent and players looked tired. I won’t count Danny Simpson as he has been with us since the start of the season, but Mike Williamson, Fitz Hall, Wayne Routledge and Leon Best have all made contributions to the cause since their arrival. They were all shrewd signings that improved the team from what it was, or at least added depth to the squad, and something that we need to continue going in the new Premier League season. New kids in the black and white! More of the Williamson’s, less of the Marcelino’s. Is Coventry striker the Best a Mag can get? QPR’s Hall Fitz nicely for cover at the Toon! Toon v Crystal Palace match banter! Oh ! so Best has a future ? And would have been interesting, if perhaps controversial, which additions to the side you recomend. C`mon you must have your druthers ? Chuck – I said yesterday Best should be moved on in my opinion. On the other hand though, he has still played a role this season, just without scoring. best is crap lets be honest…. 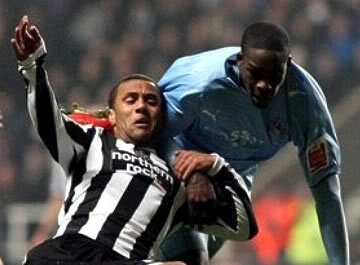 he is even behind ameobi. the fact that he cant score a goal indicates he is pants. flog him on. well it was ameobis early season goals that got us to the top of the league! Erm , is that a yes he should be moved on or a maybe he should be given a chance. Not running for office anywhere are you ? It’s a fair play for contributing to this season, now move on. It’s a fair play to Leon Best for contributing* this season, now he needs moving on in my opinion. * By contributing I refer to the cross for Andy Carroll’s goal at Swansea. For me Pre season and the defeat against Leyton Orient was the turning point , that was the point when a line was drawn in the sand and any one who wanted to stay crossed it . The mercinaries left and those with a backbone stood up , from that point on we had too much in the locker room for the rest of the divison . Toonsy is right that the january signings turned us from grinding out results into a team that started to out play and out class the rest but the lads before then had already built up a belief that was never going to be broken . It cant be doubted that Routledge gave the team that extra missing edge but even without him we would have gone up imo , still cant wait to see the lad in the prem running at opposing defences , he has something to prove to the teams out that division that let him go . i really do think this time round he will prove his worth at that level . Anyway,heard there is a election over at Britain right??? Good signings in the Fizzy but the jury is still out hugely with all of them In the PL. Although I do believe there isn’t that much of a difference in class between the two divisions. Well, so I read on here every day. There’s no doubt that Routledge added the balance on the right, with Jonas out on the left. My concern is that Jonas is gonna figure heavily in the Argentina squad in the WC, and then get an offer from someone else before the Prem season even starts. For me, his work rate alone is worth our stripes, but will he stay? One thing for sure, glad Hughton is doing the choosing and not those who comment on the blogs. Guarantee Best will be here next season. Well guess it`s your evaluation as opposed to Trapitoni`s and Hughtons. On another subject, Workey, was intrigued by the possibility of seeing footage of Hughie Gallagher, who when i was a kid was remembered with awe by those who had watched him. Believe i did once see part of a news reel in which he played , but was`nt in great condition.